You no longer need to attend a food festival (or wait in those unbearably long lines) to get a taste of Keizo Shimamoto’s famous ramen burger. For the past month, Shimamoto and his team having been serving their fusion creation out of a small take-out window attached to Koreatown craft cocktail bar Lock & Key, replacing what was formerly Stall 239. 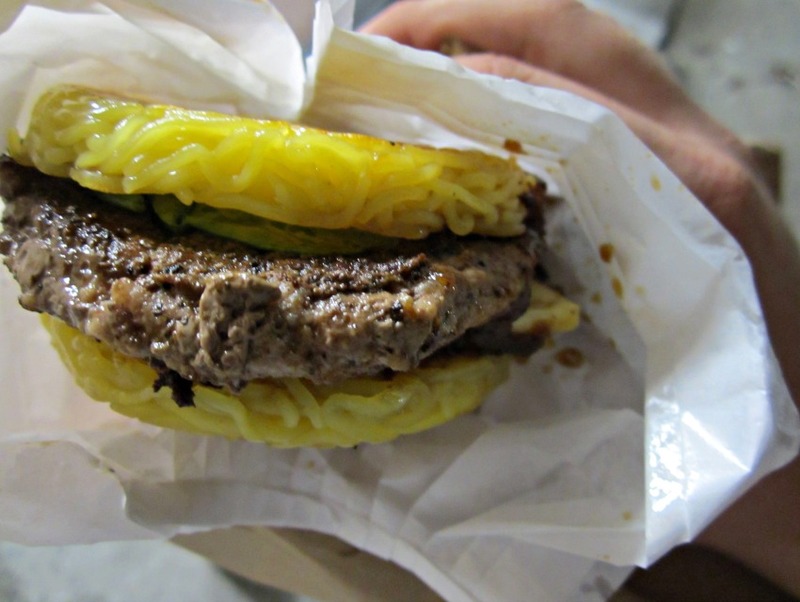 Unless you’ve been living under some type of burger-free rock for the past year or so, ramen burgers are essentially a patty stuck between two buns formed from cooked ramen noodles. 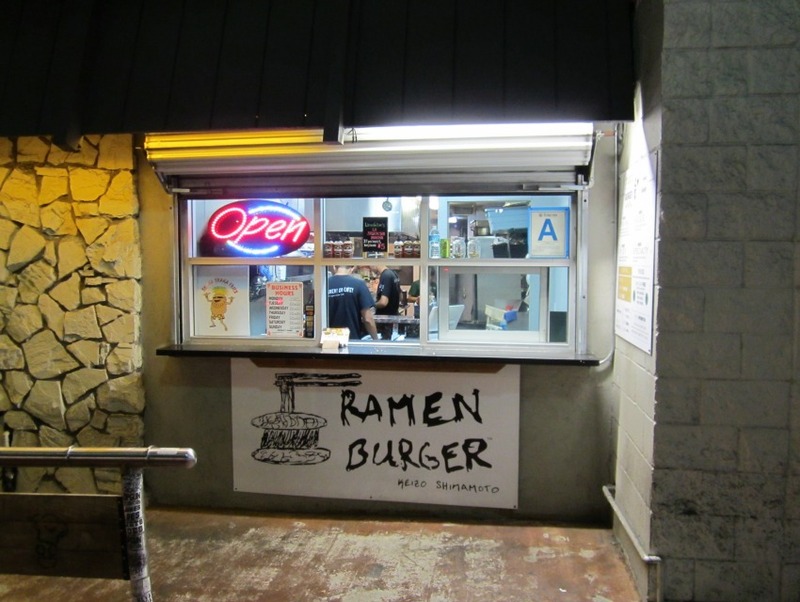 It caught on in New York—where Shimamoto opened his first Ramen Burger spot—and spread amongst foodies as a wacky cult item that went mainstream. Even Conan O’Brien tried one recently. At Original Ramen Burger, the house burger ($8) comes glazed with a sweet-salty shoyu sauce, green onions, and baby arugula. There’s also a spicy version, which adds a squirt of local hot sauce La Sriracha Macha, and another made with a veggie patty. You can add a slice of white American cheese for $1 more, or bacon or a fried egg for $2 each. On most nights, you’ll find a few folks queued up along Vermont Boulevard, but nothing resembled the hordes at most food festivals. It helps that cocktail drinkers inside Lock & Key can also order the burger while sitting along the bar. Wrapped in wax paper, the burger arrives piping hot, dripping with a thick glaze that resembled a saltier cousin of teriyaki sauce and molten cheese (yes, add on the slice of cheese for $1). The grass-fed patty is cooked to the point of well-doneness, which sacrifices some a bit of juiciness for structural support—needed to counteract the squishy-springy ramen buns and slippery layer of wilted arugula. The texture of pressed fresh noodles (seared crispy on the outside but chewy on the inside) in lieu of bread is oddly compelling, and despite what you’d imagine, the whole sandwich manages to hold together very well. It might not remind you very much of a bowl of Japanese ramen or a classic burger, but as street food it’s pretty ingenious. But would I drive across town to wrap my hands around this cult item? Maybe not, but the stand’s location belies it’s most effective purpose: Ramen Burgers are fun and satisfying handheld snack to wolf down after a few adult beverages.